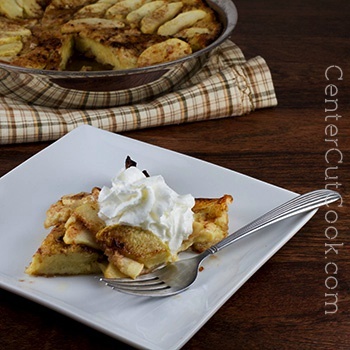 Fresh granny smith apples, and caramelized cinnamon-sugar….baked, and topped with whipped cream. A special breakfast! If you are looking for a truly special, beautiful breakfast, look no further than this recipe for Apple Cinnamon German Pancakes! Fresh sliced beautiful green granny smith apples and caramelized cinnamon-sguar come together to provide you with a pancake like none that you’ve had before! The process for making German Pancakes is quite different than typical pancakes. You start by mixing a simple batter together in your mixer and allowing it to rest for about 30 minutes, or even overnight (this is a great make-ahead recipe!). Next you move on to caramelizing the apples and the cinnamon sugar mixture in an oven-proof skillet. The batter gets poured on top, and the whole skillet gets placed in the oven for about 25 minutes. It comes out a beautiful golden brown, and my favorite way to garnish this giant pancake is with some fresh whipped cream, no syrup necessary! These Apple Cinnamon German Pancakes heat up surprisingly well the next day, you know, in case you have leftovers. ;) I’d say this recipe generously serves four, but you could easily stretch it to 6 if you served some fresh fruit alongside. In the bowl of your mixer, combine eggs, flour, baking powder, sugar, and salt. Gradually pour in milk, vanilla, and melted butter. Mix well. Cover the batter and allow it to rest for about 30 minutes. In a 10-inch oven-proof skillet, melt 1/4 cup butter. Use a pastry brush to spread the butter along the sides of the skillet. In a small bowl, combine 1/4 cup sugar with 1/2 teaspoon cinnamon. Sprinkle this mixture evenly around the skillet. Arrange the apple slices in a circle going around the bottom of the skillet. I like lots of apples, so I ended up with 2 layers of apple slices. Sprinkle 1/4 cup sugar on top of the apples and allow it to cook for a few minutes. When the apple/cinnamon sugar mixture starts bubbling, gently pour the batter on top. Place the entire skillet in the oven and bake for about 15 minutes. Reduce the heat to 375 and continue baking for about 10 more minutes. Allow the pancake to cool for a few minutes, then slice and serve with whipped cream on top, if desired.